Rev. 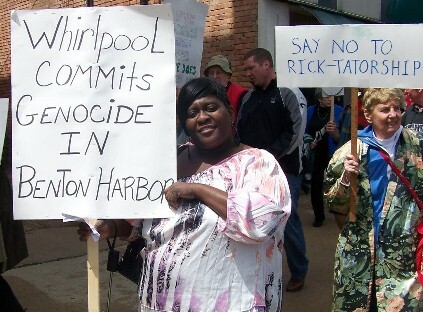 Pinkney addresses rally in Benton Harbor against Whirlpool, Emergency Manager law May 26, 2012. VOD spoke with Rev. Pinkney’s wife Dorothy Pinkney and their family spokesperson Larry Pinkney (not related) Dec. 28. They informed VOD that Rev. Pinkney’s attorneys filed two motions prior to Rev. Pinkney’s Dec. 15 sentencing to 2.5 to 10 years in state prison. Berrien County Judge Sterling Schrock refused to hear them at the time, but they will be heard in his courtroom Jan. 15, 2014, at the Berrien County Courthouse in St. Joseph, Michigan. (L to r) Rev. 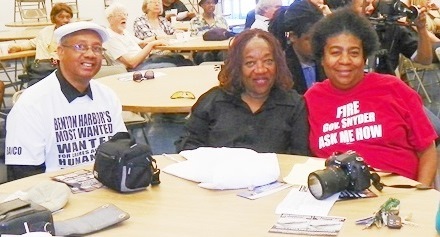 Pinkney, wife Dorothy, supporter and organizer Marcina Cole during fund-raiser at UAW Local 22 hall in Detroit Sept. 8, 2014. One motion alleges that the prosecution and court knowingly planted a juror, Gail Freehling, who is friends with one of the chief witnesses against Rev. Pinkney, Berrien County Clerk Sharon Tyler. It says Freehling also knows the Berrien County Sheriff, who initiated the raid on Rev. Pinkney’s home in May and continued terrorizing Benton Harbor residents who signed petitions to recall Mayor James Hightower. The second is a motion for mistrial, which states there was no evidence for a guilty verdict. It also includes an appeals court decision affirming that violations of the election law are misdemeanors, not felonies. Both are included at Rev. Pinkney motions from attorney Tat Parish. Rev. Pinkney’s photo from Charles Egeler Reception Facility shows that he remains strong, optimistic and unbowed. Dorothy Pinkney told VOD, “I cannot visit my husband yet because he is still in quarantine at Jackson prison, but I am able to receive calls from him. His spirit is good. His voice sounds like himself. He is still hoping to come out of this situation. He knows a lot of people are concerned and working on his behalf against this racist attack. We’re all waiting on the judge’s decision on the motions Jan. 15. An appeal is ready to go forth if they are denied. Rev. Pinkney asks that everyone continue the boycott of Whirlpool, as well as the Harbor Shores development, and the Sr. PGA which is held at its golf course, all backed by Whirlpool. Dorothy Pinkney said when the appeal is filed if the motions are denied, the Michigan American Civil Liberties Union (ACLU) plans to become involved in the case. She said her husband is locked down 23 out of 24 hours a day, and is assigned only one hour a day to make phone calls, so she remains available at any time for his calls. He said contributions can be made online through PayPal on the Black Autonomy Community Network Organization (BANCO) website at http://www.bhbanco.org/. Contributions through check or money order can be mailed c/o BANCO, 1940 Union Ave. Benton Harbor, MI 49022. Supporters of Rev. Edward Pinkney comfort Dorothy Pinkney after his sentencing Dec. 15, 2014. They Include Detroiters Abayomi Azikiwe, Marian Kramer, and Monica Patrick. photo donated to People’s Tribune. DETROIT – Michigan political prisoner Rev. 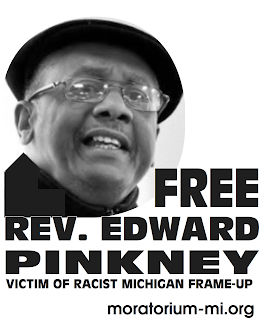 Edward Pinkney is now being held in Jackson state prison. 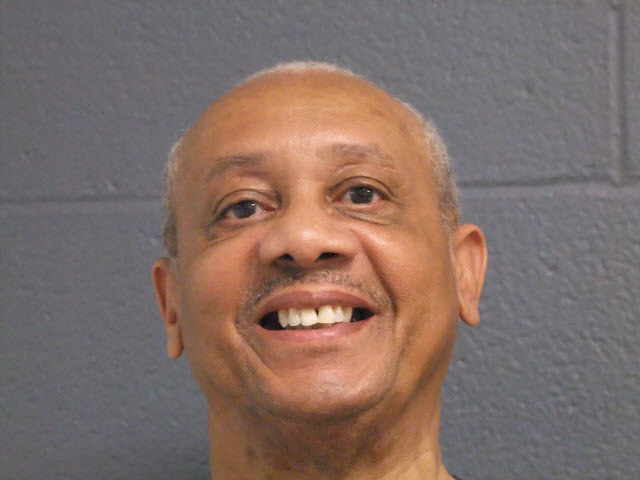 He remains in good spirits despite what many Michigan citizens have labeled the “racial injustice” that has landed him in detention over claims he changed the dates on five signature entries on a recall petition designed to remove Benton Harbor Mayor James Hightower. 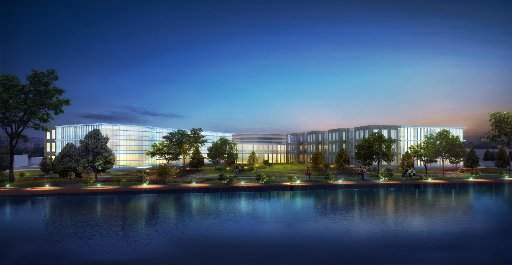 $85 Million Whirlpool headquarters on St. Joseph River in Benton Harbor. Whirlpool shut down all its plants in Benton Harbor, laying off thousands, and is now in the midst of a massive land grab. 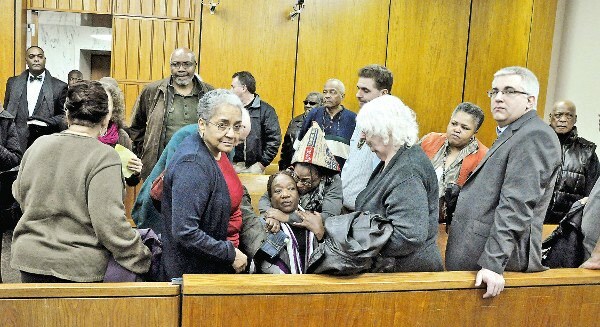 During the course of the trial there was no material or circumstantial evidence presented that would implicate Pinkney in the purported five felonies. Many believe the Berrien County activist and leader of the Black Autonomy Network Community Organization (BANCO) is being punished by the local authorities for opposing the corporate program of Whirlpool Corporation, which is headquartered in Benton Harbor. 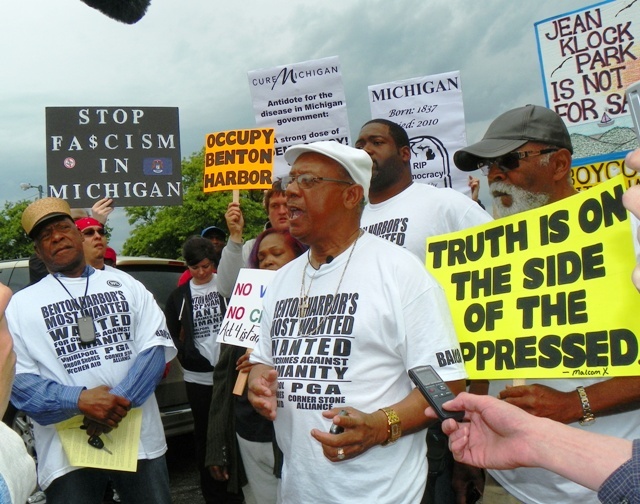 In 2012, Pinkney and BANCO led an “Occupy the PGA” demonstration against the world-renown golf tournament that was held at the newly-created Jack Nicklaus Signature Golf Course on Lake Michigan. The course was carved out of Jean Klock Park, which had been donated to the City of Benton Harbor decades ago. 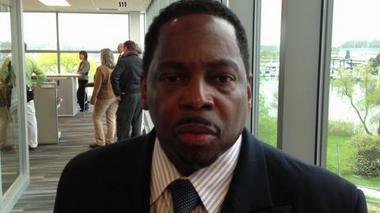 Benton Harbor Mayor James Hightower at Whirlpool HQ event. Berrien County officials were determined to defeat a recall campaign [in which Rev. 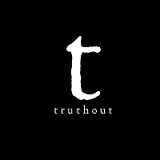 Pinkney participated] against Mayor James Hightower of Benton Harbor who opposed a program to tax local corporations [like Whirlpool] in an effort to create jobs and improve conditions in the majority African American municipality. Benton Harbor, like other Michigan cities, has been devastated by widespread poverty and unemployment. 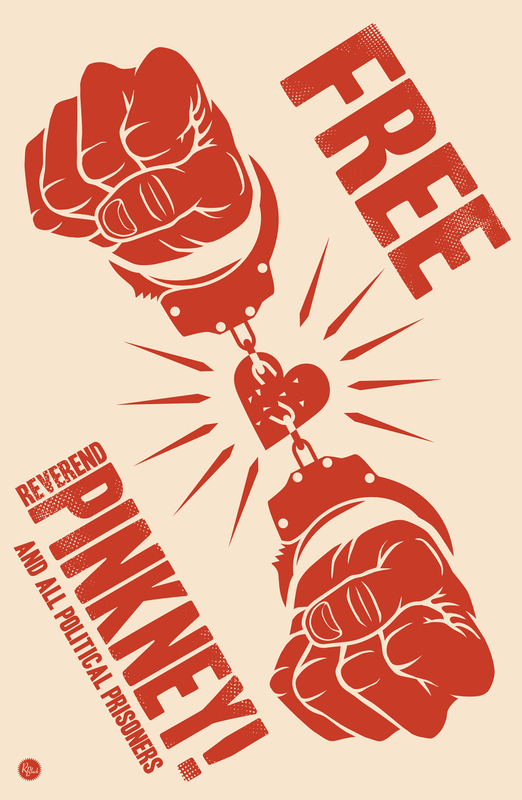 This is not the first time that Pinkney has been imprisoned for his political activities. In 2007, he was convicted in a second trial, with the first ending in a hung jury, for “mishandling” absentee ballots during a recall election involving two Benton Harbor City Commissioners. The results of the elections removing the officials were overturned after criminal charges were filed against the BANCO leader. Pinkney was sentenced to one year under house arrest and four more years of probation. Later in 2007, he was charged with violating his terms of the sentence for allegedly threatening a judge in Berrien County. 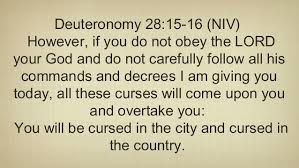 The threat charge stemmed from an article he wrote in the People’s Tribune newspaper based in Chicago where he quoted scriptures from the Old Testament. 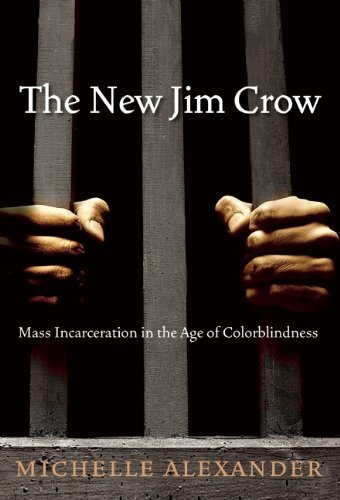 He was ordered imprisoned for 3-10 years. The charges were overturned in late 2008 by the Michigan Appeals Court after the activist received widespread support from the civil liberties, ecumenical and academic communities across the country. He was released at the end of 2008, and successfully completed his probation returning to full-time activism in Berrien County. Rev. Pinkney ran for Congress against Whirlpool-sponsored Fred Upton on the Green Party slate in 2008. 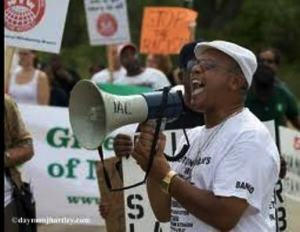 Pinkney, in 2008 from his prison cell, ran for United States Congress on the Green Party ticket in Michigan. He received 3,500 votes in a challenge to Fred Upton, a Republican congressman and heir to the Whirpool corporate dynasty. The conference call included activist members of the clergy, electoral reform organizers, former Green Party candidates, progressive Democrats, the People’s Tribune newspaper, Moratorium NOW! Coalition, and others. The call provided an update on the case, plans to publicize the plight of Rev. 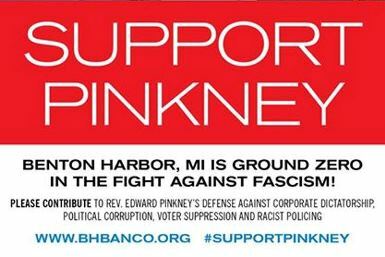 Pinkney and the people of Berrien County, recruiting a legal team and a fundraising drive to proceed with an appeal.